Ferry to Haida Gwaii | Turning my world upside down! The morning ferry to Haida Gwaii was uneventful except for sighting 2 humpback whales and a couple of porpoises. Ya right! We have been doing very well in sighting wildlife on this trip. I’ll have to list them off at some point before the end of the vacation. As we arrived in Haida Gwaii we drove north towards Masset. We were immediately greeted by the locals. No, not the Haida, the deer! We counted over 30 deer on the side of the road in 100 kms. My friend Marlene also lived in Masset at some point. It’s where she met the love of her life and spouse of 41 years, Larry. It seemed appropriate that we were travelling to Masset on her birthday, my own private tribute – Happy Birthday Marlene! The weather did try to clear as we sailed over the Hecate Strait but rain followed us in earnest for the next 3 days. I had wanted to visit Haida Gwaii since I watched a David Suzuki documentary of these islands in the North Pacific. They are notable as a rain forest, traditional lands of the Haida First Nation whose renowned art is essentially a visual representation of their history. It’s their writing, in a sense. They are very proud of their history, which they can recite to over 10,000 years ago. 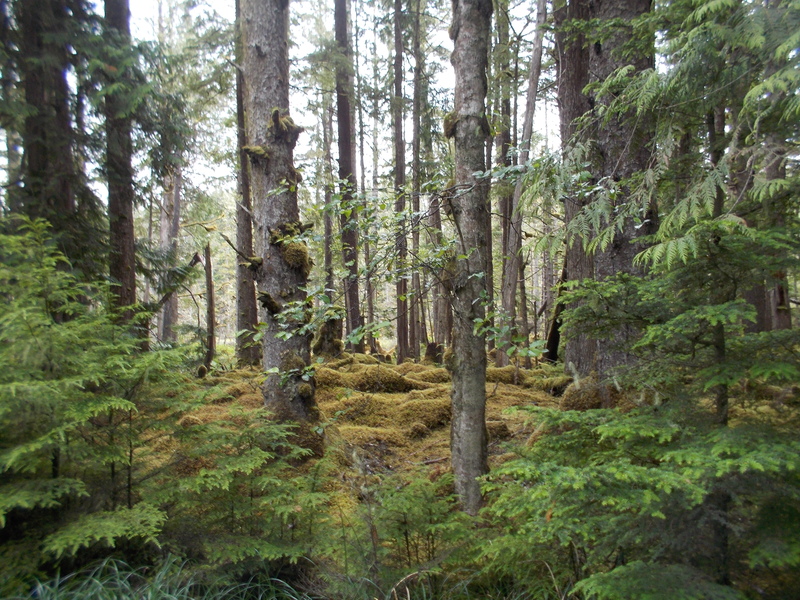 In terms of geology, it would seem that Haida Gwaii was actually connected to the mainland by a large meadow until the glaciers came and receded, leaving the Hecate Strait. I know it’s more complex than that but this is the short version. 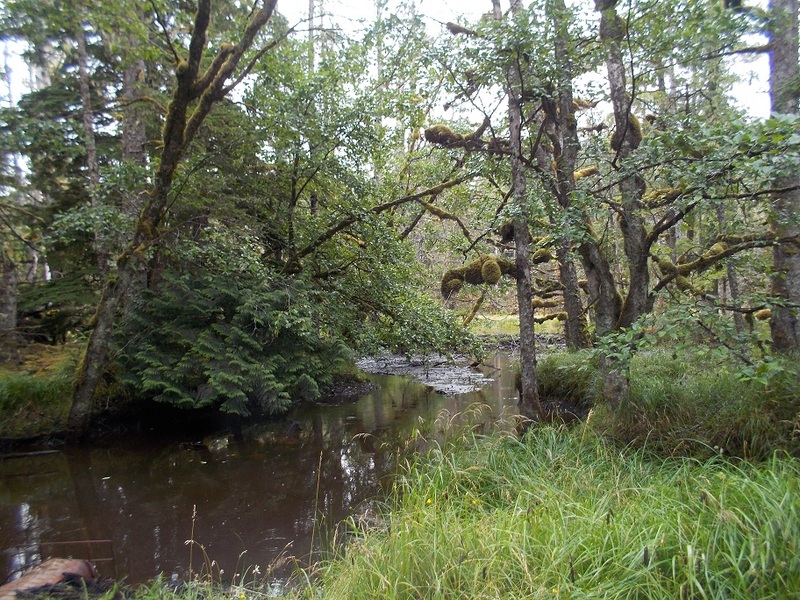 Graham and Moresby comprise the main part of Haida Gwaii. We only visited Graham Island, and of that, mostly the east side. After our arrival, we drove directly to Masset to check out this former Canadian Forces base (correct me if I am wrong Marlene). The private married quarters have been updated and converted to private homes, while the barracks are currently being torn down. I met a lady at the campground who told me she had just purchased a duplex, both sides, for herself and her son to live in. She told me she paid $44,900 for it. I am not clear whether that was for one side of the duplex or both. Her intention is to update her side of the duplex and create a B & B in the basement, while renting the other side to her son. I am not sure how much demand there is for a B & B on the former military base, but I am no judge. Still it was interesting to drive around and imagine what it was like when the Canadian Forces occupied the area. I think the base closed down in the mid to late 1980s. While we were in town, we went to the local grocery store looking to replenish our supply of milk and fish. I was shocked that there was no fresh fish for sale. Perhaps everyone just fishes for their own? Leon and I were also disappointed that we couldn’t find any seafood like crab or halibut, nor a fresh fish market. This one is for sale. Typical duplex around the former base. We could see it from the highway but you can’t go in. You must visit Haida Gwaii then! Getting pictures of the critters is near impossible though when you are on a ferry.